I realize that this may look very similar to the Book of Secrets project. The day before the "final," I explained the expectations to the students. I also explained that this was their LAST LARGE PROJECT (ok, I know it's a one-day project, but they HAD to know there would be a lot of weight on it in order for some of them to stay motivated on the last day), so they better do a bang-up job! Also, I tried to guilt them into doing it because, "You don't want someone else to do a crappy job on yours, so don't do it to them!" Of course, some students still didn't care, but we all make choices. I was, however, quite impressed by how many students really did put forth a lot of effort in the short amount of time that they had. 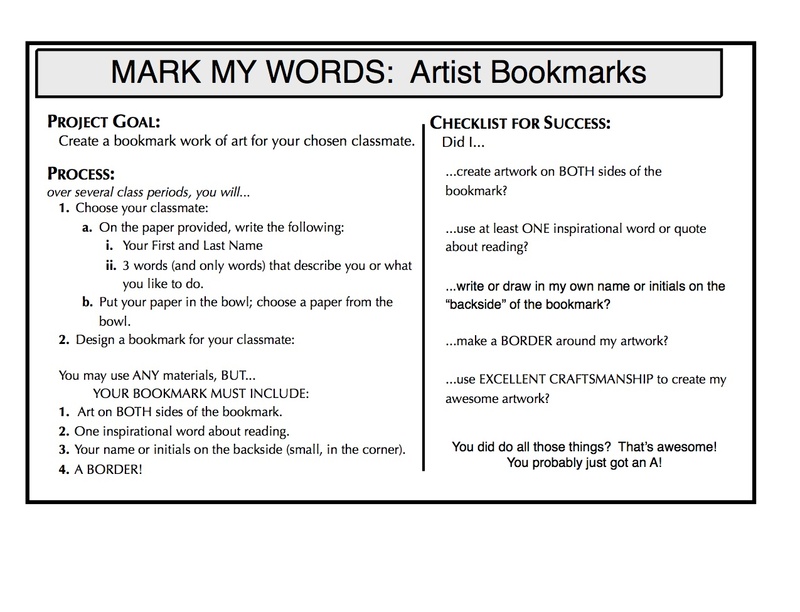 You might be thinking, "Come on, a bookmark as a FINAL?" 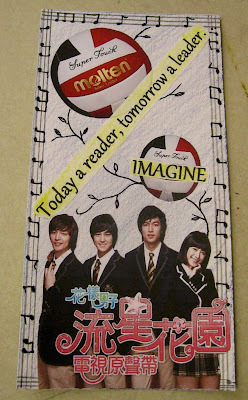 This bookmark covered MULTIPLE aspects of our year in a timed 90 minutes. Students had to create emphasis, use elements of design, could use any media they wanted, use a border, use text, and most importantly, they had to BRAINSTORM (think), PLAN (think), ORGANIZE (decide) a composition, and EXECUTE (create). Ok, so back to what I was saying- I started the day before by explaining the process. 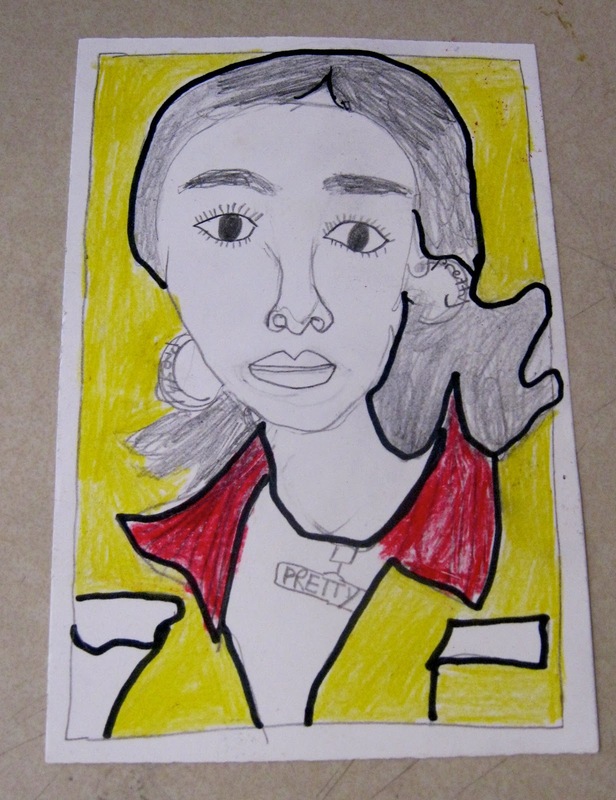 I relate this project to something like an artist trading card, in which students (artists) create little pieces of artwork that they could then trade with other students (artists). 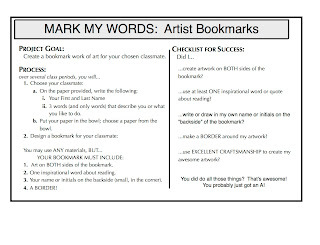 I had a powerpoint ready, but chose not to show it since it did not necessarily directly relate to the idea of bookmarks- sometimes students have a hard time translating a similar process into the expectations of the project. Next, students took a small blank piece of paper and wrote down the following: You first and last name, 3 words that describe you or activities that you like to do (Only one word per!). They folded the piece and dropped it into a bowl. We then picked from the bowl. (Actually, this only worked well in ONE of my classes; the other classes, I had them exchange with someone in the class of their choice.) Students were to then design the bookmark using the information on the paper as inspiration. 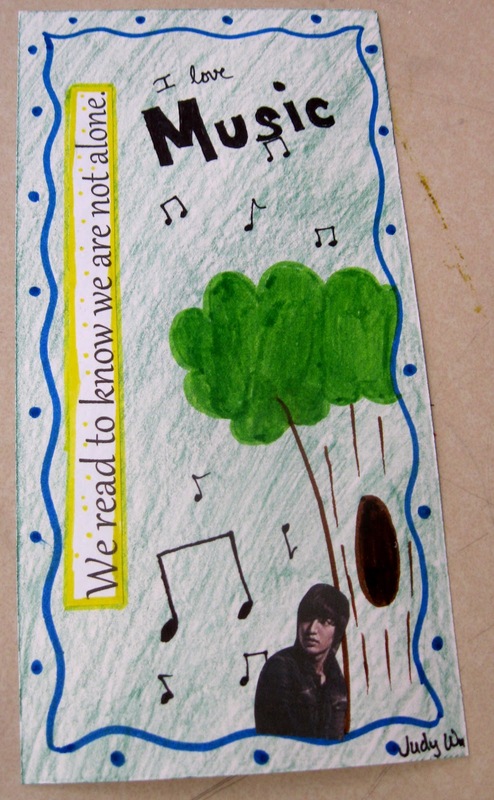 They, however, HAD TO include a border, an inspirational word or quote about/related to reading, have artwork on both sides, and their name/initials on one side. Students had that day to think, brainstorm, and plan their attack. 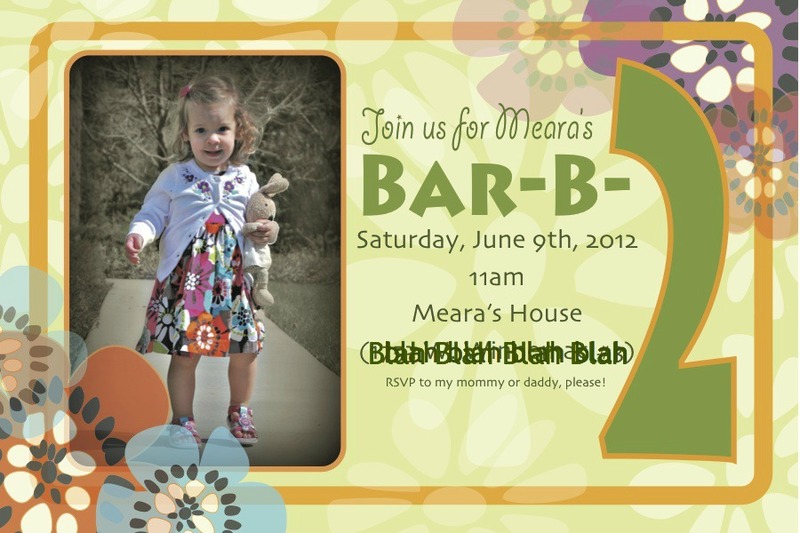 home on off-white card stock. I used her dress as my inspiration. cupcake stickers on the back. In between catching up on adding my lessons from this past year to the blog, I of course want to keep everyone apprised as to what else I'm up to in the creative sense. Lately, unfortunately, not a whole lot. OK! Give it a rest. I have been going full steam since... oh, since... what seems like forever. After I finished my second year of teaching, and after starting two new jobs since my daughter was born, I am finally giving myself a "break." What does that look like? No, I am not sitting on the couch every day with my feet up, eating bon bons (which consequently my husband just asked me... "What is a bon bon, really?" My reply? "Ummm, you know... chocolate covered ice cream nibblets?") So, if you are also as curious as we were... here's a great little blog I came across when googling "What is a bon bon?" Oh, thank you GOOGLE! "So what the heck ARE you doing?" You ask. Last summer we received a CSA (Comminuty Supported Agriculture) from Windy Ridge Acres Farm in Woodstock, IL. I loved getting our fresh share each week of veggies and fruits. Though, some of it I had no idea what to do with, and some of it I had no idea what "it" was! I learned so much- like how to use up tons of kale (kale lasagna, kale chips, kale and sausage pasta,...). Even though I wasn't making a ton of art last summer, I really do feel that cooking can easily satisfy that creative outlet. Indeed, cooking is in itself, an art form. Something to eat while you are making art, perhaps? This summer, I wasn't able to sign up in time for a CSA, so I plan on visiting our local farmer's markets throughout the weeks. I know my husband was always pleased to come home to a creative, new, and fresh dinner each night (which maybe makes up for the 10 months of tombstone pizza, chicken nuggets, and other such "goodies" that we tend to serve up over my "working" months). I never blogged about all of the creative solutions you have to come up with when cooking with a CSA share, but I probably should have. C'est la vie! Annnnnd, here is my segue. I did not have time to cook or prepare ANYTHING for my daughter's 2nd birthday party. That is mostly because I was working, but also because the rest of the "free" time was used planning and prepping and making and baking her magnificent birthday cake!! (I am biased, if you haven't figured that out yet.) Baking was my creative outlet this time. 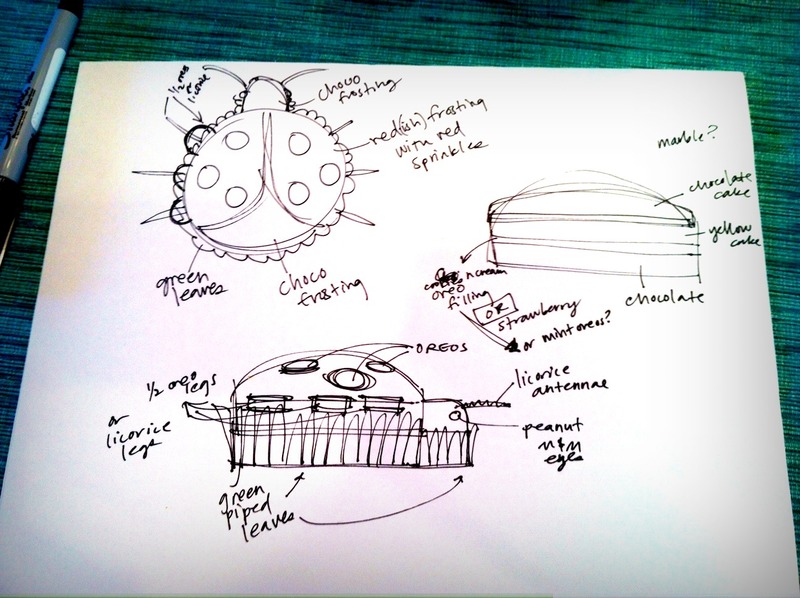 I was not about to make some rectangle cake and slap on some ladybug design! Oh NO! 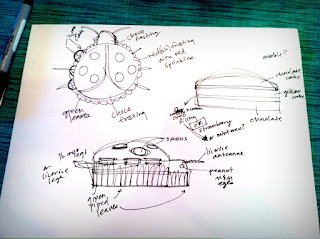 To the right, you can see my diagram/sketch for the plan of this crazy cake. It would have 3 layers, and a ton of frosting. My original challenge was to come up the red for the frosting without using red food dye. Now, I am not super crunchy, but I am super sensitive about food dyes. Long story, but I'm sure many of you are aware of physical ailments/behaviors connected with food dyes. Because of my own sensitivities, I have just simply tried to steer clear of any such artificial food dyes for Meara (as much as in my control). Pumping her frosting full of red dye did not really appeal to me- as that was what everyone suggested in order to get a true red frosting. I researched other options, and even tested a few ideas the week before. I tried crushing strawberries and/or raspberries and adding it to the frosting. This made the frosting frothy and taste like a pretty good filling, actually. I also thought about slicing up strawberries or raspberries and placing them all over the top to "look" like a red ladybug. That didn't really work in my favor either. I ended up going with the red food dye. Yes, yes. I know. But I figure, once a year won't do much harm, right? RIGHT? I also covered the (mostly pink) frosting with little red sugar sprinkles to make the ladybug truly red. My husband came up with the very genius idea of using Oreos for the spots. I bought black licorice "red vines" for the legs and antennae. My grandpa LOVED black licorice, but apparently my husband hates it. I think that a lot of people don't like black licorice, so I was surprised to find it fairly easily at the grocery store. I used peanut m&m's for the eyes. Yes, I did say... cakesssssss. I ended up making: 1 Duncan Hines Butter Recipe Cake Mix, 1 Duncan Hines Devil's Food Cake Mix, and 1 Betty Crocker Chocolate Fudge Cake Mix. Yes, I made them from the boxes. How much time do you think I have??? All three cakes were made in 9" round pans. I baked the cakes on Thursday night and let them sit in the pans overnight. On Friday, I cut the two Duncan Hines cakes in half and cut off the risen puffy parts. (You know, when the cake rises in the middle). I kept the risen cutoff from the chocolate cake and used that as the slightly rounded top to the ladybug shape. I alternated the butter and chocolate cakes and used a cookies 'n' cream filling. I placed the cakes in the fridge to set up for about an hour. While that was setting, I took the fudge cake and cut it into two small semicircles for the head. I filled that with the cookies 'n' cream filling and popped that in the fridge. 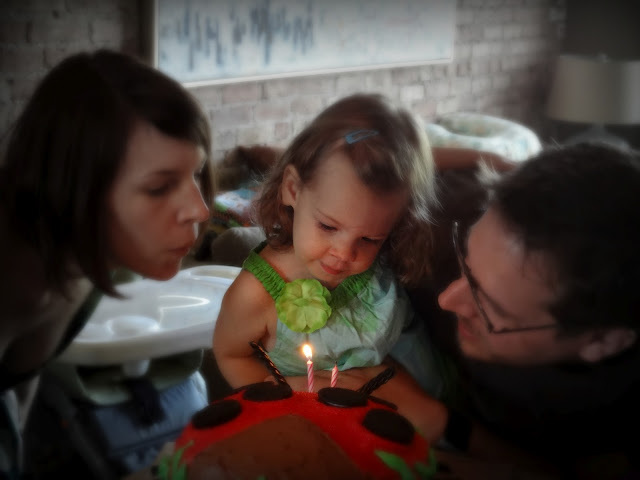 Last year, for Meara's cake, I wanted to make a super light frosting- I'm not a huge fan of the super sugary frosting on most store bought cakes. For my wedding cake, we had chosen a "French Buttercream" frosting because it was so very light. I remember researching different frostings last year, and trying one recipe that uses egg whites. It was not until I actually made the frosting that I realized that any recipe for frosting that uses egg whites = meringue! I had thrown out that frosting and tried again. This year, I kept trying to figure out which recipe I used! I found a clipping from Real Simple. This recipe is good, and similar to most others I found give or take a cup or teaspoon. Pretty much it's just butter, confectioner's sugar, vanilla, and milk. I used heavy whipping cream instead of milk and that helps the frosting to "move" (be more spreadable), and also cuts the butter and sugar while still keeping a light and rich taste. I doubled (or tripled?) the recipe and cut into three. One, I added red dye; one I added green dye; and the last I added cocoa powder to which tasted great!! With the cake and frosting back in the fridge to set up enough to try again, I flopped down on the couch and (im)patiently waited. Finally, I was able to finish up the grass, though it didn't look as clean as I had hoped since I took some unused licorice and tried "pulling" the grass back into place (and hoped form some interesting grass texture in the meantime?). With the spots, legs, antennae, and eyes in place, I took a damp paper towel and cleaned up the board. Back in the fridge for the night. Last year, I had forgotten to take the cake out early enough and the cake and frosting were still fairly hard when cutting. This time, I pulled it out about 20 minutes before serving and it was perfect!